Scecina pitcher Julia Blastic (center) and other teammates celebrate as Lea Thompson (right) runs home after Justice Carmichael's grand-slam home run during Scecina's 7-4 victory over Cathedral in the high school city softball title game at Brookside Park, Saturday, May 9, 2015. I went back and forth on this one. This whole "covering Election Day Obama campaign volunteers in Columbus" idea started with talking to Harold, an Obama '08 volunteer, while covering the President's event in Columbus in October. And yet, I ended up not using his material because I got enough on that day. I thought of making the end result just audio, and then I thought of putting the photos on top to make an audio slideshow, and then I settled on keeping the audio and photos separate. Makes the navigation through all this stuff freer, I guess. Finally, the decision to follow Obama volunteers instead of Romney volunteers came from talking with Harold and wanting to finish that story. Of course, that didn't pan out, but something else did. Seriously, these people are dedicated. As for the photos: I didn't do any coverage in 2008 (besides one Obama-with-a-baby photo that became my first work published in the IDS), so this presidential election has been an eye-opener. I carried over some lessons from covering the midterm elections in 2010 for the IDS, but of course this year everything played out on a much larger scale. I'm no Damon Winter or Charles Dharapak, but maybe I'm getting there, and I'm sure Demotix appreciates it. Obama campaign staging location director Jay Smith makes the call to close the German Village field office at the end of Election Day, Nov. 7, 2012, in Columbus, Ohio. I'm about to leave the Microtel south of Columbus, Ohio, but before I do, I wanted to post to the site a few photos from Cleveland, where Obama made a late (started at 8 p.m.) stop at Burke Lakefront Airport. He was raspy from the rest of his cross-country tour, but I've never seen him use his fists so much. This deserves a study like I did for Paul Ryan, but there isn't much time for that now. Maybe later. Maybe. Of course, there are many more Obama photos on Demotix. What didn't make it there: At least two people had to leave the area I was in because they were close to fainting before Obama spoke, and one was near tears while he spoke. That "Fired up! Ready to go!" chant is a bit more literal than one might think. Also, Romney and Ryan were in Ohio yesterday, too. Mitt was in Cincinnati in the morning, and Paul was in Defiance, Ohio, in the evening. I wish I could have gone to those events, as well, but there are only so many miles one can drive in a day. 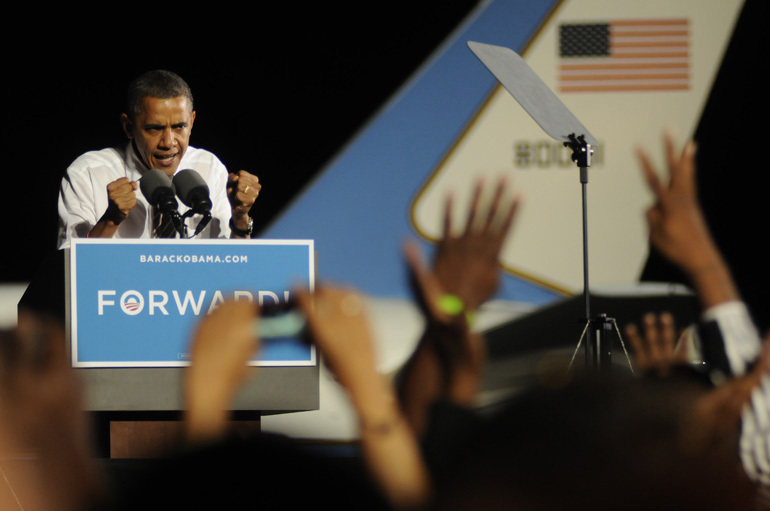 President Barack Obama makes a forceful point to an estimated 12,000 people at Burke Lakefront Airport in Cleveland during the last stop on his two-day cross-country campaign swing, Thursday, October 25, 2012. Before Cleveland, Obama flew to Chicago, where he cast his early vote.